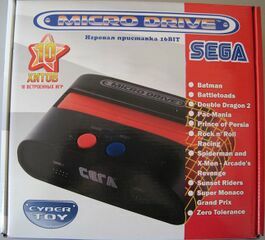 The Micro Drive is a Sega Mega Drive clone console manufactured by Cyber Toy for Russian markets. They are small Mega Drives with a cartridge slots and ten built-in games. There are two Micro Drives, black and white, each containing a different selection of games. Despite its looks, the Micro Drive is in fact an officially licensed Sega product.